The ST-120 is a high speed, accurate, robust starter motor tester. This touch screen PC based machine is designed to achieve a high production rate with minimal tooling change over for End-of-Line production testing. Thank you for your interest in the ST-120. Please fill out the form below so we can send you the brochure. Thank you for your interest in the ST-120. Your request has been submitted to our sales department, and we will get back to you soon. The ST-120 is available in ‘Standard’ and ‘Heavy Duty’ versions. 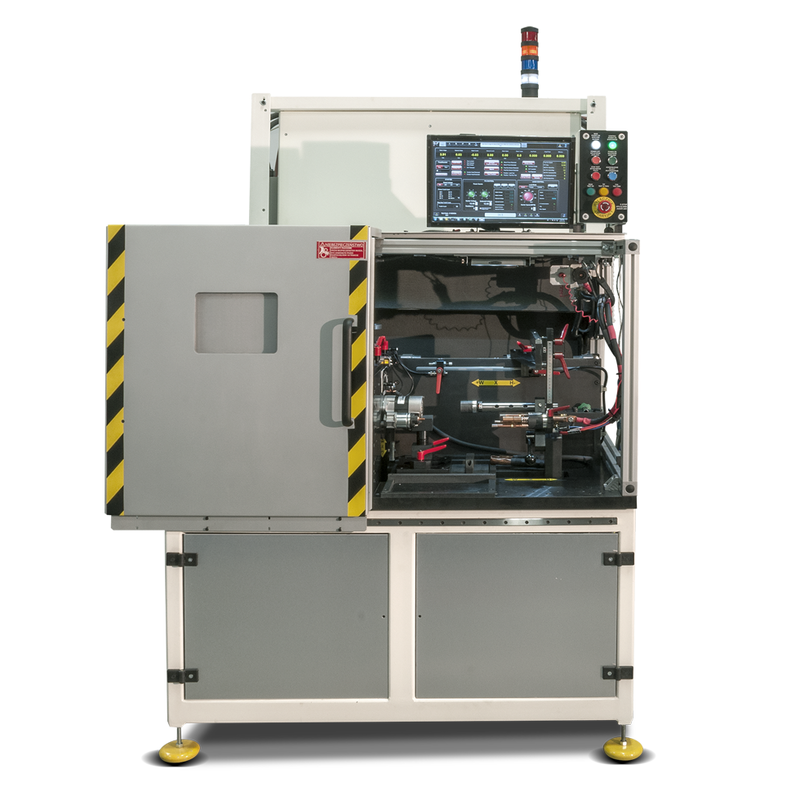 Start-Stop and Change-of-Mind testing capabilities, flexible operation with automatic/manual connection tooling for a wide range of starters, high efficiency testing with industry leading cycle time and fast load/unload, and precision product diagnostics with state of the art data acquisition and processing are all main features of the ST-120. Measures more than 40 different starter parameters including performance curve, free run current and speed, solenoid current, contact voltage drop, “R” terminal function, coast down time, magnetic seal, pull-in & hold-in voltage/current, solenoid pull-in and release time for comprehensive production testing. Set load test conditions by speed, torque or current at fixed voltage or predefined battery for testing versatility. Industry leading technology with advanced diagnostic, high accuracy performance, free run speed, solenoid block, pinion movement (optional) and coast down (stop) tests. Tests starter, solenoid, drive, and pinion engage, disengage timing and optional pinion movement/retract test that can reveal faulty components or assembly errors. Solenoid “aging” function to seat the solenoid contacts. Performance test by step or sweep method with inertia compensation. Complete performance plot for less than 6 seconds reducing temperature related result variations and increased accuracy and consistency of results. Built in thermal compensation with optional part temperature infrared sensor. Scripting of test procedure provides complete control of test process. Optional sound and vibration analysis packages with order tracking and optional unsupervised automatic learning mode. ser configurable Pass and Fail labels and reports with performance curve plotting torque, power, speed, and voltage. Designed from the ground up with operator health and safety in mind. The DUT loading point is close to the operator providing improved ergonomics with less lifting and movement. On screen, step by step user configurable installation and setup instructions for error-free operation and minimal training. The extra wide operator guard opening allows for full and easy access for the operator to load the DUT. Maximum efficiencies are maintained by the automatic starting of the test when the door is closed and after the test, the guard door is automatically opened. Operator timeout feature available. Effective material management. Programmable reject bin input, reject acknowledgement, marking device output, pass/fail labels and report generation. Tooling recognition by bar-coded components and hand held scanner eliminates setup errors. Computer controlled programmable 1500 Amp starter power (3000 Amp for ST-120HD), simulating 200 – 2000 CCA battery (0 – 30 milliohms). Computer controlled 120 Amp (240 Amps for ST120HD) programmable solenoid power supply. Available in many operating voltages (220 to 480V at 50/60 Hz).